Bacteria are unicellular prokaryotes. They lack true nucleus and other membranous bound organdies. Some species form colonies. Most prokaryotic have diameter between 1-5Am. 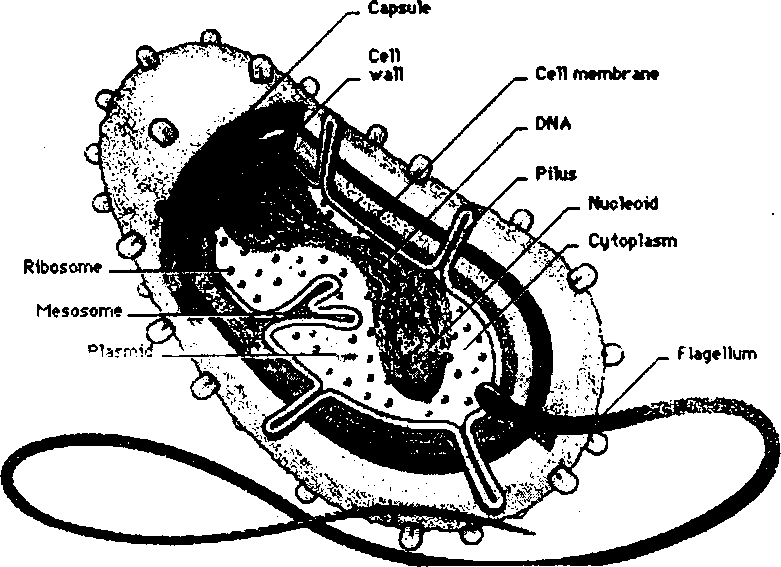 Bacterial cell is composed of following structures: flagella, cell envelope, cell membrane, cytoplasmic matrix, spores. Cell envelope is composed of cell wall. In some bacteria structures lie slime and capsule are also present. Cell wall is present beneath the extra cellular substances. It is present outside the cytoplasmic membranes. It is rigid structure. It determines the shape of the bacteria. Cell wall also protects the cells from the osmotic lysis. Cell wall is absent in Mycoplasma. The cell wall is essential for the survival of many bacteria. The antibiotic penicillin is able to kill bacteria by inhibiting a step in the synthesis of peptidoglycan. The cell walls of most bacteria have a unique macromolecule called peptidoglycan. Its amount is different in different types of bacteria. It is composed of long framework of glycan (glucose) chains. These glycan chains are linked with peptide fragments. The intact cell wall also contains some molecules of sugar, techoic acid, lipoproteins and Lipopolysaccharides. These molecules are linked to peptidoglycan. negative bacteria is absent in some bacteria. Some bacteria have no cell wall at all. The cell wall of Archaeobacteria is different from the Eubacteria. Archaeobacteria do not contain peptidoglycan. Their cell wall is composed of proteins, glycoprotein and polysaccharides. Thick peptidoglycan layer. Teichoic Acids and I ipoids are present. They form lipoteichoic acids. It acts as chelating agents, and also for certain types of adherence. Flagellum (only in some species) if present, it contains two rings for support. (b) Gram Negative bacteria: They are stained pink with this staining technique. They retain secondary dye colour. 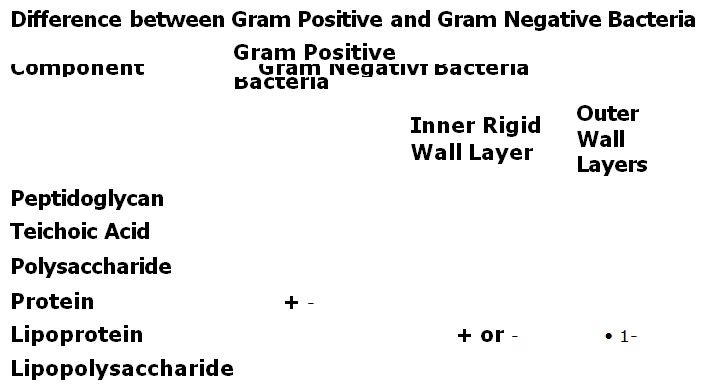 Gram negative bacteria have lesser amount of peptidoglycan. It has more complex structure. 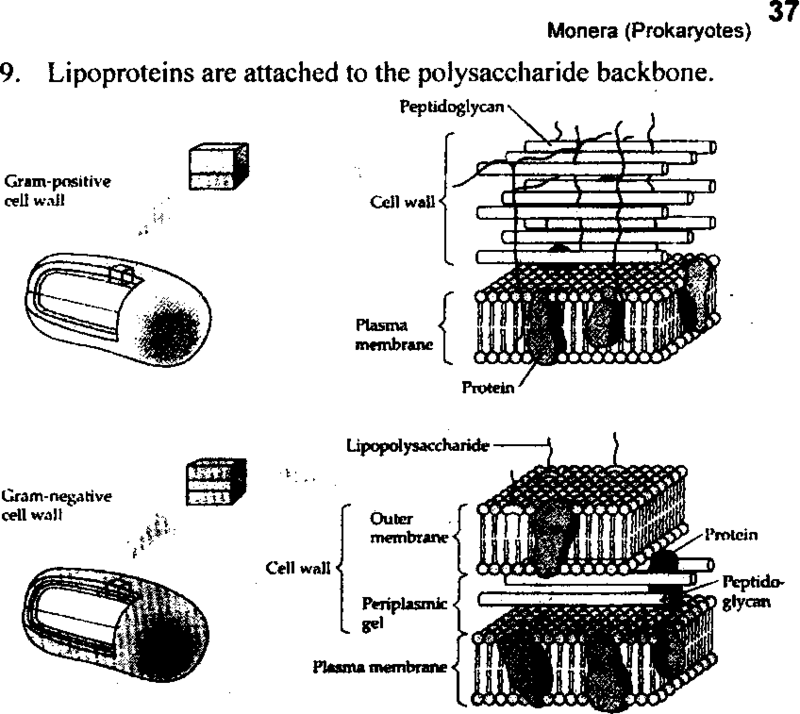 An outer membrane of lipopolysaccharides is present outer to the peptidoglycan layer. Gram negative species are more dangerous than the Gram positive bacteria. 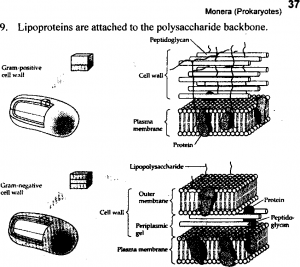 The lipopolysaccharides layer is often toxic. This layer protects the bacteria from the immune system of host. 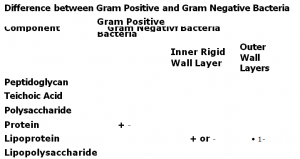 Gram negative bacteria are more resistant to antibiotics. Its examples is Pseudomonas. 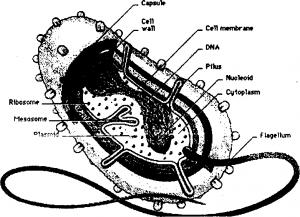 Some bacteria produce capsule out side the cell waII. It is made up of repeating units of polysaccharides Or proteins or both. The capsule is tightly bound with the cell wall. It has thick and gummy nature. It makes the encapsulated bacteria sticky. Bacteria can attach with the substrate with their capsule. It also helps bacteria to attach with each other and form colonies. Capsule makes the bacteria resistant to antibiotics. Some bacteria are coveted with loose, soluble shield of macromolecules called slime. Slime provides greater pathogenicity to bacteria. It protects the bacteria against Phagocytosis. Fimbriae are fine filaments of protein. These are just 2— 10 nano metres in diameter and up to several micrometers in length. They are distributed over the surface of the cell. They resemble fine hairs when seen under the electron microscope. Fimbriae are involved in attachment to solid surfaces or to other cells. These are also essential for the virulence of some bacterial pathogens. 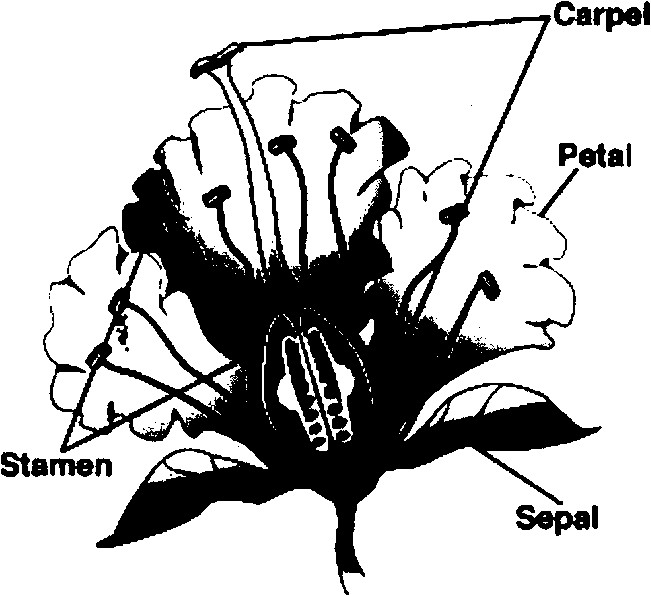 Pili are hollow, non-helical and filamentous appendages present on cell wall. Pili are smaller than the flagella. True pili are present only in gram-positive bacteria. They are made up of special proteins called pilin. Pili are not involved in locomotion. They are primarily involved conjugation. Conjugation is a mating process. Some pili are used for the attachment of bacteria with various surfaces. ab kisi b jaga bet kr sabaq yad karsakte hai books to sath leney k zarorat nahi rahi..